Lateral bike racks deliver sophisticated flare and modern utility—ready to add a new level to streetscape aesthetics. These squared, inverted 'U' style bike racks are thoughtfully designed with an innovative blend of extruded aluminum and a choice of premium wood top accent. 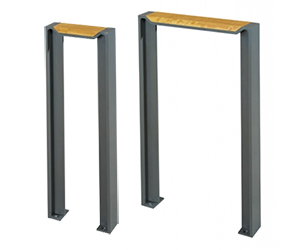 Constructed to provide dual point locking contact, Lateral bike racks feature a protective finishes that ensure the original high quality characteristics remain intact throughout many years of service.